Menendez has introduced a bill that provides an interesting twist on the idea of principal reduction. The Preserving American Homeownership Act would encourage lenders to write down principal balances by allowing them to share in the home’s appreciation at a later date. The principal balance would be written down in increments over a three year period to 95% of the current value, so long as the homeowner remains current on their payments. In exchange for the write-down, the lender would receive a fixed percentage of any future appreciation when the home is either sold or re-financed. That share could not exceed 50%. So if a principal balance was reduced by 25%, the bank would receive 25% of any future appreciation. The Act would apply to primary residences only, but any homeowner could apply. Borrowers who are in default or even in foreclosure could qualify, but would be required to make their reduced mortgage payment on time in order to remain in the program. The article in DSNews where I read about the bill did not indicate if the Act would apply to all types of loans or whether or not the modified loans would be re-written at today’s lower interest rates. 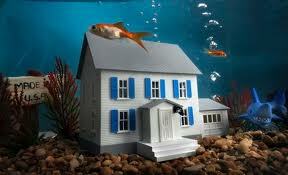 Presuming so, this Act could provide enough incentive to many underwater homeowners to persuade them to stay in their home versus initiating a strategic default. As a fan of principal reduction, I like this idea as it seems to be a win-win situation for both homeowners and the banks. Banks don’t take as big a hit as they would with a short sale or foreclosure, and the write-down is taken over a three year period, AND homeowners get to keep their homes with reduced payments and principal. Even the opponents of principal reduction might find something to like about this plan! Before You Call Your Lender, Be Prepared! If you owe more than your home is worth, and are having difficulty making your payments, you may be a good candidate for a loan modification or a short sale. The important thing to realize is that this problem won’t go away on its own and the sooner you attempt to deal with it, the better your opportunity for a positive outcome. A completed financial worksheet which outlines ALL of your income and monthly expenses. Make sure that the income you state matches the deposits to your bank accounts! Last 2 months pay stubs or year-to-date profit and loss statement if self-employed. This initial interview is a sort of triage, where they try to determine, what program, (if any), might work for your situation. The more information you have available, the quicker you will be able to move to the next step. Even if the interview doesn’t include questions related to your tax returns, these are the items they will want you to send to them so it’s best to gather everything before you get started. When you do send or fax, make sure that your name, phone number, email and loan number are on a cover sheet with a list of the items included. For the initial packet of information it may be best to send with a delivery confirmation so that you have proof of mailing and delivery. Your hardship letter should clearly explain why you can no longer afford your mortgage payments. You obviously could afford them at the time the loan was originated, what happened to change that? Job loss? Death of a spouse? Divorce? This should be a heart-felt letter addressed To Whom It May Concern and be no longer than a couple of paragraphs. Just state the facts. It is helpful to write the letter before you call so that you have an answer ready when the interviewer asks. On this initial interview, and all subsequent phone conversations keep a log, noting the date, time, who you spoke with and the key points of your conversation. Always ask about the time frame for the next steps and be prepared to follow-up! Never assume that something is happening….chances are good that your paperwork may become lost, so be ready to re-send it. And if you don’t feel like you’re getting anywhere, ask to speak to a supervisor. But remember that the folks working in the loan workout department are probably over-worked, and a nice comment and a polite “thank you” will make the process less stressful for everyone involved. Best of luck! Don’t hesitate to call or email with any questions. I also have a great Excel Financial Worksheet that I’m happy to share. Just send me a request to marti@kilby.com.